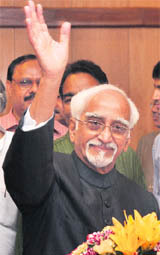 Ruling UPA nominee Hamid Ansari was today elected Vice-President of the country for a second successive term in a largely one-sided electoral battle. He will be sworn in at Rashtrapati Bhawan on Saturday. 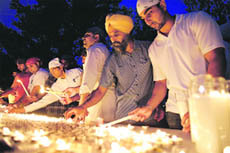 US President Barack Obama said Americans would �recoil� if the shootings at a gurdwara in Wisconsin on Sunday were �motivated in some way by the ethnicity of those who were attending the temple.� Obama said he was �heartbroken� by the deadly shooting. The Delhi police will question Haryana Minister Gopal Kanda on Wednesday in the alleged suicide case of former MDLR group employee Geetika Sharma. A day after targeting an Indian forward post in the Arnia sector along the 192-km-long International Border (IB), Indian and Pakistani troops again traded small arms fire after Pakistan Rangers violated mutually brokered truce, firing at forward posts in Hiranagar and Poonch sectors along the Line of Control last night. Eleven persons have died since yesterday after consuming illicit liquor in Johal Nangal and Baleywal villages of Gurdaspur district. While three persons died yesterday, eight more deaths were reported today. Tribune Exclusive: 100m World Champion Yohan Blake talks about missing the Olympic gold, Usain Bolt and much more. In about a year's time visitors to the historic caves at Ajanta will have to satisfy themselves gaping at the replica of the ancient monuments as the Archaeological Survey of India (ASI) prepares to shut down the four major caves at the historic site to tourists.